Fresh powder carpets the ground, the air is cold and thin, everyone around you is in their Carhartt beanies and The North Face jackets, smiles adorn the faces of everyone around you…you must be at the X Games Aspen. Hosting concerts at the X Games is a relatively new concept for the annual extreme sports event. The first X Games Presents Concert series kicked off in 2013. This year’s lineup included artists returning to Buttermilk Mountain for a second go around. The lineup for the X Games concerts was announced late-September. Lil Wayne was scheduled for Friday, Louis the Child and The Chainsmokers were slated for Saturday with Kygo set-up to be the closer on Sunday afternoon. Kygo and The Chainsmokers were the veterans, back in Aspen to performance at the X Games for their fans in the Rocky Mountains. Kygo made his first appearance at the games in 2016 and The Chainsmokers found themselves on stage in 2017. 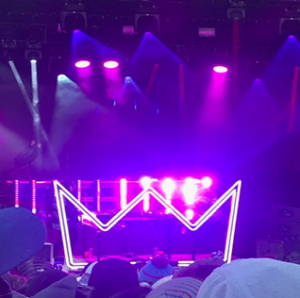 Louis the Child performed Saturday. The group is composed of 22-year-old Robert (Robby) Hauldren and 21-year-old Frederic (Freddy) Kennett. Hauldren is the DJ of the group and the only one to go to college, while Kennett, the group’s producer, dove headfirst into the music industry. Kennett and Hauldren strolled out onto the stage in unison and showed their personalities immediately. Hauldren, the more extroverted of the two, was the man on the microphone throughout most of the set. The duo decided to go with a couple of relatively older tracks that were crowd favorites and succeeded in getting the energy up early on. They chose to play Slow Down Love and Fire, both from the group’s 2017 album Love is Alive, but added a bit of a different twist to them as most artists do for live sets. Immediately following, their next song choice remixed Plug Walk by Atlanta rapper Rich the Kid. In interviews, they had stated they don’t mind remixing popular songs and giving them a bit of a Louis the Child twist, and it was evident from that moment that they weren’t kidding. The remixes or sampling that I was able to identify from ear varied from New Freezer, Feel the Love, Blasé, All Night and The Circle of Life. Although the two faced each other for most of the set, playing off of their shared energy, Hauldren was the one who spearheaded crowd engagement and interaction, while Kennett kept the tracks spinning, though Kennett would encourage the audience to clap or connect with them by shaping his hands into hearts to show his admiration for their attendance. At one point, Hauldren got so hyped up he took it upon himself to jump in the crowd for a little bit, living out a dream many entertainers can relate to. After Hauldren maneuvered his way back onto the stage, the set started to wrap up with tracks from their newest album, Kids at Play. Going with The City and Save Me from Myself, then closing with Love, there was a palpable yearning from the crowd for more, and that is exactly what they received. Better Not was the group’s first-time cracking into Billboard’s Top 20 for Dance/Electronic songs and it electrified the entire crowd when they played it for their encore. Heavy synths combined with melodic beats to bop your head to is where Louis the Child can be found at their best. While the stage presence left you wanting for more, their lighting, graphics, music and genuine happiness were also on full display.